I’m a proponent for reading books before watching the movies. 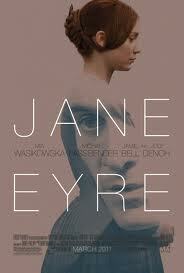 After seeing the trailer for the upcoming version, I decided I finally need to read Jane Eyre. I will fully admit that I have been extremely prejudiced against this book since I was in high school. Why? Because I hated, no, loathed Wuthering Heights. I am fully aware how ridiculous that is, considering they were written by different people, but I’m not going to lie right now and tell you I just didn’t get around to reading it. English major moment: I studied a little bit about the author, Charlotte Brontë. She was born about a year before Jane Austen died. Charlotte first published Jane Eyre under the pseudonym Currer Bell because it was so much easier for men to get published. Her siblings all died young, mainly because of tuberculosis. And their last name is supposed to be pronounced Bron-tee, not Bron-tay. At this point, I am almost halfway through the book. I was a little confused at first about who was narrating, but once I figured it out, I’ve been pretty content. There are some really supernatural themes that I wasn’t expecting. I’m not sure if I’m supposed to like Mr. Rochester or not, but because the name is so familiar in the literary world, I assume I am. I think I like him, but it’s still a little early to know. Considering how dark it has been so far, and how Wuthering Heights should have been called Misery Loves Company, I should probably prepare myself for an unhappily ever after, but barring any major awful-ness, I’m going on record as saying I might even like Jane Eyre. Yarn tie-in: They talk about the girls knitting in the book.